The University of Castilla-La Mancha (UCLM) is based in the autonomous community of Castilla-La Mancha, on an area of almost eighty thousand square kilometers covering the provinces of Albacete, Ciudad Real, Cuenca, Toledo and Guadalajara. It has a wide academic offer and virtual secretariat. 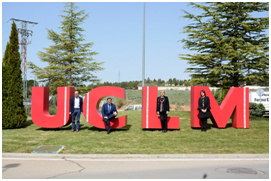 The UCLM commitment to excellence, cytema is a commitment of the UCLM for teaching, research and knowledge transfer in Energy and Environment. Its strategic plan is committed to the vision of a sustainable and modern university. His incorporation to the board was unanimously approved, being an honor for the strength it represents and for his activities that reinforce the approaches of the Global Food System.